It’s a general knowledge that while working with a general CAD system, the drafter is limited to a vector image. On the other hand, working with Revit seems to have multiple options and plugins to make it to 3D and tweak and turn the designs. In general, construction firms and design consultants have a very twisted perception of BIM at this stage. However, there have been several ‘BIM activist’ organizations who have brought insights to channelize this perception. What we have done is laid emphasis on architectural designs, structural plans and MEP layout in 3D for adopting BIM. Don’t take it otherwise; there is nothing wrong in that. But what we intended to say is “that isn’t just it”. It is creating an imbalance of file exports and data sharing if it’s all made 3D centric. The fact that BIM will begin with 3D is unarguable, but stopping there is a sin. There is more to add to 3D model’s life by accumulating data to it. In fact, BIM is more of a data-centric strategy to adopt than just making 3D designs. 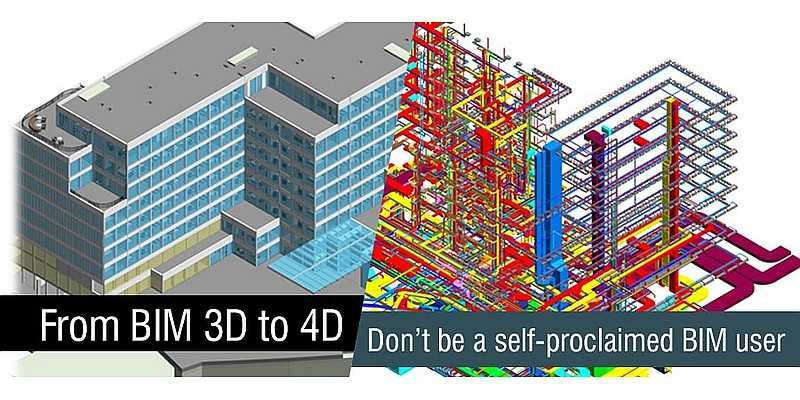 Better still; make BIM data-centric with 3D designs, to fetch more ROIs. It goes without saying that to a contractor a 3D model [even on a BIM platform] is just as good as paper-based blueprint, just that the earlier is a little easier to interpret and explain. Although they are actively engaged on gaining all the possible outcomes and benefits out of BIM, they do not see any significant growth with just 3D. Now for a design consultant, their aim is to deliver a design and construction progress schedule, such that it brings the minimum costs to their construction clients. Amongst the other goals, there are increasing contract profitability, aid in increasing the efficiency of construction, and technically safe construction plan. On other hand, contractors, or construction firms need to use their resources optimally and within timeframes in order to be profitable. This all can come to the constriction doorsteps only when BIM is used for process planning, to collaborate every design, by project managers, for workers on site and just everything and everyone involved in construction management. Off course, let us not forget that 3D still lies at the center of design and construction, but it can be refined with 4D for planning and scheduling. Since contractors are more eager to manage their onsite tasks, design consultants, too, are embracing collaborative approach in 4D BIM to manage client relations. However, to ensure the transformation happens, design consultants are now required to keep their original 3D model updated from the viewpoint of every discipline. Secondly, in order to keep the model updated in real time means to have a continuously tracked progress from onsite activities as well. It clearly raises the need for design firms need to adopt Revit in full-scale to ensure updates can be made through app and data can be accessed from cloud-based connectivity. Gaurang Trivedi, The BIM Hub, 26 October 2017.